Harisadhan Ghosh, a vice-president of Darjeeling district Trinamul and a Mukul Roy inductee, resigned from the party today, saying he disliked how Roy had been cornered. The former deputy mayor of Siliguri Municipal Corporation who had joined Trinamul on September 4, 2013, in the presence of Mamata Banerjee and Mukul Roy said that one of the reasons for which he quit was the way Roy had been "humiliated" and "insulted" in the party. "I had joined Trinamul with the aspiration that the new government will work for development. But over the past couple of years, Trinamul leaders and ministers seemed more keen on shielding those who have siphoned off peoples' money through Saradha," Ghosh said today. "Also, the manner in which Mukul Roy has been cornered in the party and stripped of his posts has left me disappointed. He was humiliated and insulted in the party. I could not take it and decided to leave the party. I have connections with Mukul Roy and I speak to him on a regular basis. I haven't yet decided to join any other party and have severed my ties with Trinamul." Trinamul leaders, however, said Ghosh had wanted to contest from ward 12 in the civic polls and he left as Trinamul did not assure him of it. Ghosh was earlier with the CPI. He was the vice-chairman of Siliguri municipality from 1989 to 1994. In 1994, the municipality was made a municipal corporation. Ghosh became the deputy mayor in 1997 and served till 2004. This morning, Ghosh sent his resignation to minister and Darjeeling district Trinamul president, Gautam Deb. 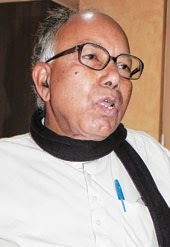 "I have mentioned my grievances in writing," Ghosh said. Trinamul leaders were not ready to buy the story. "He wanted to contest from ward 12 in the SMC polls. We tried to make it clear that the final decision would be taken by the state committee and we could not commit. That is why he left. Whatever else he has said is baseless. He has made such remarks only to hide the real reason," Deb said. Ghosh has been contesting from the ward since 1997. Trinamul insiders said that ever since Ghosh joined the party, his interest had been to contest from ward 12, where he stays, on a Trinamul ticket. "Things would have been favourable if the seat in ward 11,(next to ward 12), would not have been reserved for women. As the seat was reserved, Nantu Pal, the former councillor of ward 11, decided to contest from ward 12. Going by popularity and importance, Pal is much ahead (of Ghosh)," said a source. Pal's wife would contest from ward 11.